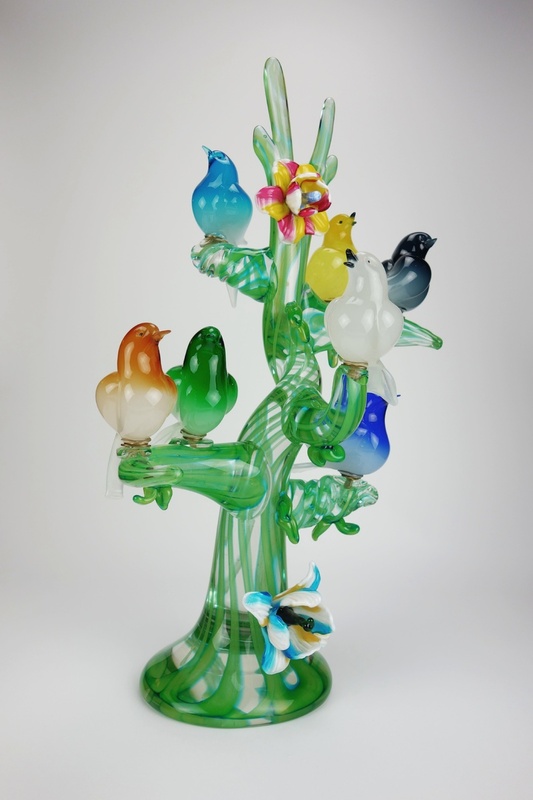 In Art Glass > Murano and Italian Art Glass > Show & Tell and Figurines > Show & Tell. lisa saved to Put a bird on it! 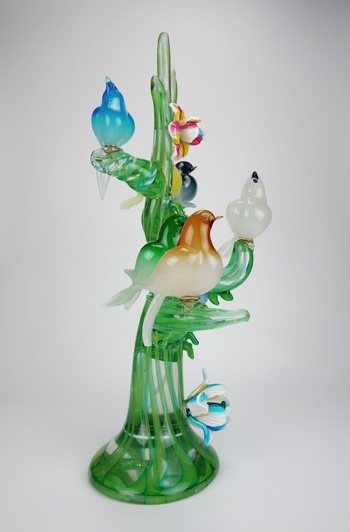 This Murano scupture has a prominent place in my curio. It is depicts a flock of seven polychrome birds perched in a tree. The trunk is adorned with a pair of applied flowers, which I believe adds a bit of interest to the tree. It was made by Enrico Cammozzo circa 1980's and is a huge piece, standing 24" h x 17" w. As always, thanks for looking. Thank you so much Inky, and thanks for the quick loves Gloworm, Brat and Vetraio, it's appreciated. Wow, I would be afraid just to move it to take a Pic of it!! Gorgeous !! I WAS afraid Rose. It took a long time for me to get up the nerve to move it in order to take the photos! Also, thanks for the love Aghcollect and Rose. Hard to imagine the time & work it took to create this! Thank you Blunderbuss and Sean. Yes, it had to be a master glass maker to create this piece. 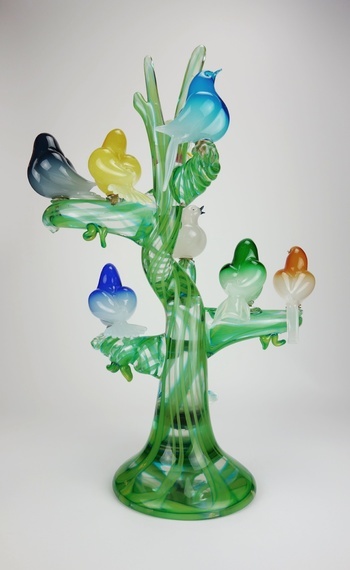 That's why i love glass!You can make everything in any way.Wonderful! Incredible Rick. So so special. Thank you so much for the kind comments Ivonne, Race, Mike and DrFluffy, and for the loves Katherine, PatSea and Austrohungaro, it's appreciated. Totally entrancing......you could turn it through 90 degrees every so often and have a completely new piece. Oh la la! Lol. Thank you Sklo. Yes, it does look great from all sides, but for now, I'll enjoy the front! Also, thank you for the love Toolate, CindB, Hunter and Lisa. Your comments and loves are appreciated. Thank you so much Artglass. Gloria and I have always loved Murano birds too. There are so many shapes, styles, colors and sizes which makes collecting them so enjoyable. Also, thanks for the love Vladimir your comments and loves are appreciated. Thank you for the love Manikin. Wonderful I adore birds. Dorita is the woman that is our main provider, perhaps my syntax was not correct, jaja. Thank you Silvia. Now THAT makes sense - Little Dora. Also, thanks for the love DD and Budek. Thank you Martika I appreciate your kind comment! Thank you Mrs T, it's my favorite Murano sculptural piece! Yes, Rick55, as well it should!! My husband bought me a much smaller Murano with two birds and it sits in my kitchen window. They are lovely. 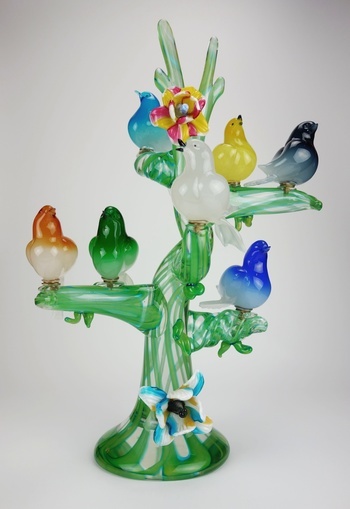 I'm sure it's beautiful Mrs. T. I find that Murano birds-on-a-branch sculptures are some of their nicest pieces. Take a look at my old posts. There's a pink by Alfredo Barbini that you may like.